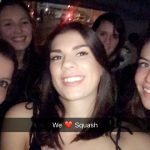 Following an unfortunate relegation from the Premier League earlier in the year the Northumbria Ladies team ventured to Liverpool on the 4th/5th November for their first Division 1 match in living memory. Despite this the mood in the car on the way down was high – the tunes were flowing and even a few wrong turns and a 20 minute queue, caused by a few scousers pretending to be lollipop men, wasn’t enough to dampen it. Maria was on first and, never having won a senior inter-county match before, was looking forward to finally making a positive contribution to the team’s efforts. As it happens it turns out division 1 was more her speed and she silenced the haters (*cough* Emma *cough*) picking up the first win of the weekend. Northumbria 1 – Nottinghamshire 0. Hannah ever the consummate professional was up next and breezed to a standard 3-0 victory. Northumbria 2- Nottinghamshire 0. Kim was back as the county’s No. 1 after taking a hiatus following a near career ending (from embarrassment) defeat to a 13 yr old during her previous county appearance. Off to a slow start Kim went 1-0 down, the usually calm and collected Hannah even commenting ‘this is stressing me out’. Kim however was unfazed ‘this is just the warm up’ she assured us at half time. It was a transformation of an athlete pre and post steroid proportions and Kim was quick to win the next two games. Unfortunately Nottingham’s ploy to grease the courts before Kim’s match meant she couldn’t quite keep on her feet falling over twice in quick succession. The maestro, however, would not be deterred and managed to come back for 10-6 down in the 5th to clinch the victory. Northumbria 3 – Nottingham 0. Josie was on 4th and faced a brunette middle aged lady who’s speed was alarmingly deceptive. No match for Josie, however, whose tomato and ham Upper Crust did little to slow her down and she demolished her opponent as fast as the chocolate chip muffin she had for dessert. Northumbria 4 – Nottinghamshire 0. Sam’s opponent, a mother, who had brought along her 6yr old to watch was absolutely no match. Sam ruthlessly demolished her, leaving a broken shell in her wake and ensuring that little girl would never look at her mother the same way again. Northumbria 5 – Nottingham 0. Overall a promising start to the day. The second match against against Merseyside, the home team, came after a round of Greggs during the 2 hr intermission between matches. I wanted to keep the write up for the second match short and just conclude that everyone won 3-0 in a uneventful fashion. Something that can be said for 4/5th’s of the team. Kim’s game, as ever, proved more problematic. I think she just likes giving me something to write about. After winning the first two games with a relative ease, Kim opted to put several in the tin giving the 3rd game as an early Christmas present to her opponent. After some sage words from the rest of the team Kim went on to win the fourth very quickly. Why couldn’t she just do that in the first place? All that’s left to say after the first day of matches is… bring on the sesh. The third and final match came on day 2 and after a very thorough celebration following the wins of the previous day. It hadn’t been that late a night (a sensible 2am) but it had been a messy one therefore we were anxious as to how the games would play out. Fortunately the opposition, Staffordshire, turned up with only 3 so we only needed 1 match to win. 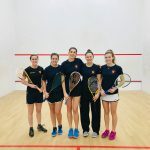 It proved easy enough and despite raging hangovers Kim, Sam and Hannah trounced to comfortable victories Northumbria 5 – Staffordshire 0. Overall a very successful weekend, bring on the second round!